On the following pages, you will read about initiatives that are successfully narrowing the digital divide around the globe. 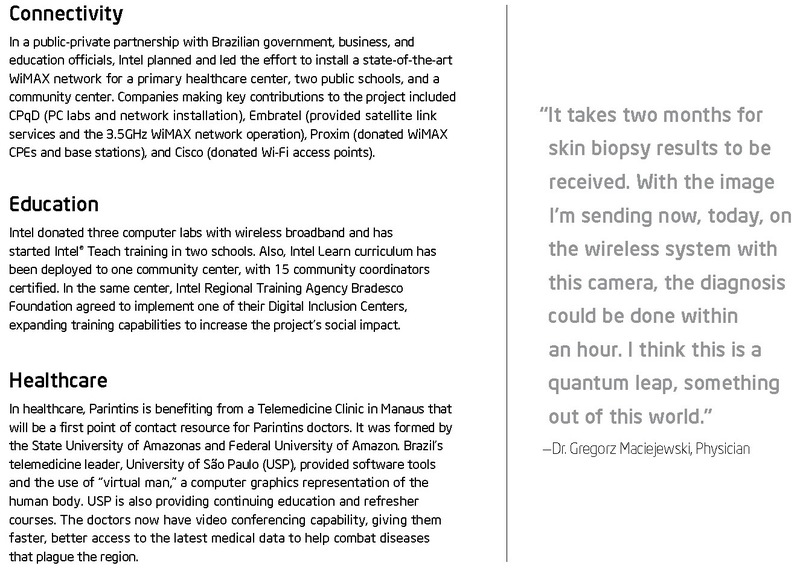 In five countries on three continents, new wireless broadband capabilities are connecting residents of formerly isolated villages to the world’s largest knowledge library, medical resource, and marketplace—the internet. In five diverse locations, each with its own unique hurdles and solutions, enormous progress was made in just a short time, while ongoing projects and new plans carry hope into the future. These successes were built on the powerful concept of public-private partnerships. They are a testament to what can happen when regional players in business, government, non-governmental organizations, education, and technology join forces—each taking on key responsibilities to bring the benefits of ICT to their developing communities.